All I want is my happily ever after. If we can get through this, we'll finally be Rose and Noah, a family, forever. But first we have to survive the road ahead. And happily ever after is a long way off. Now that Noah has cancelled his engagement to Constance, the small Amish community of Meadowview is left reeling. It's not the way of their people, and Noah fears that Elijah Schwartz will turn the community against his family. After giving into temptation, Rose is now pregnant and living back at home with her family. The feisty and passionate English girl was removed from her Amish foster parents by her father, seeing that Rose is only seventeen. Her father and brother Sam only want what's best for her, and that isn't Noah. Living within the Amish community will destroy her spirit, and neither will stand by and allow Rose to make that mistake again. Noah's actions have consequences that also affect his siblings, namely Sarah. Sarah is now unable to court Micha Schwartz, his father would never allow it after Noah left his daughter heartbroken. But not falling for Micha is easier said than done, and the two will find a way to be together. Unaware to the storm of emotions next door, Rose is struggling to hide her pregnancy from her father and has yet to tell Noah. Noah is insistent that the two are to wait to announce their union, emotions are still too raw within his community. But Rose is in no position to wait and doesn't know how to break the news to Noah about her pregnancy. With Sam, best friend Summer and little brother Justin for support, Rose weighs up her options. Does she really want to live within the Amish lifestyle and raise her child without the liberties that come with being English? Rose's father may be against their union, but Noah's parents will support the couple once they wed and Rose becomes a part of their community once again after waiting until Rose's birthday, six months away. It's time that Rose no longer has. But when another option arises, it may not just be the pressure of the pregnancy that is clouding Rose's judgement. Hunter is in love with Rose and she can't deny that she has feelings for Hunter and in another lifetime, they may have very well been together. But when Rose confesses that she's pregnant, surprisingly Hunter offers his full support, even if she is carrying Noah's child. But before she's considered what her future hold's, Noah is planning on buying land within the community, but Elijah is determined to punish the Miller family. Whether it be snaring the land that Noah planned to build his family home upon, to a new horse to ease the pain of losing Rumor. Something needs to give, but when Noah hears the news of Rose's pregnancy from an unlikely source, his well laid plans are thrown into turmoil. But if Rose won't rejoin the Amish community, can Noah live a life outside of the only home he's ever known? As tragedy strikes and effects both families, life will never be the same again. Can the two families and community come together for the sake of Rose and Noah's happiness? 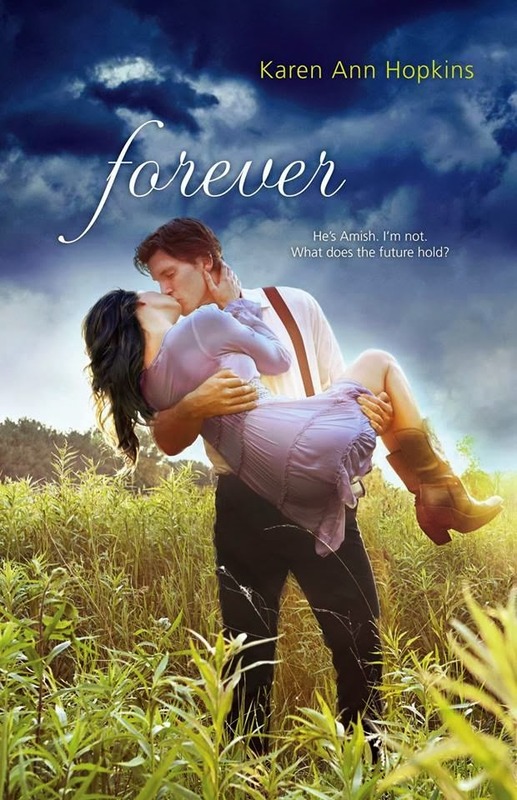 Forever is the third and final installment in the Temptation series and follows the story of the forbidden love between Noah, the Amish boy and his next door neighbour Rose, the English girl, the term the community uses for those who aren't Amish. It's a modern day twist on the classic Romeo and Juliet, where both families are the major influence within the young couples relationship. Although pregnant, Rose has lost her warmth and vivaciousness, being separated from Noah and the pressure his community is now placing upon his family are almost too much for Rose to bear. Noah is torn between his love for Rose and his community, which for most of us sounds like a simple decision. Imagine having to change your way of life in a instant, but he expects Rose to submit to the Amish way of life... Or who knows what will become of them. Noah was frustrating and seemed to have lost his will to fight for his girl, allowing the community to dictate the terms of their relationship, but unwilling to compromise when anything other than Rose becoming Amish arises. I enjoyed Sarah and Micha's side story, the two teens not quite courting, but enjoying what seems to be their first attraction. Karen Ann Hopkins has an incredibly laid back style of writing, but I feel that there may have been a little too much drama in Forever. It followed the same format as both Temptation and Belonging, books one and two in the series, but Rose, Noah, Sarah and Sam all share their thoughts and readers see a new insight from their points of view. I'd love to see a novella depicting Sam and Summer's story, I adore Summer's brutal honesty and lack of a verbal filter. By including Sam's point of view, I think his story may be on the cards. Fingers crossed. Sounds interesting, I've never heard of this series before and it sounds like it's a decent contemporary romance. Hope you get the novella that you're looking for. Hey Jeann and thanks for popping by. The first book in the series was incredibly charming, the second was not too bad, but Forever, the final book in the series is well and truly over dramatised, I just had to know how it ended though.